From a glance, they might simply look like wooden branches in really cool vases. But look close and you can see there are delicious little flowers sprouting from the branches. You know how they saw money doesn’t grow on trees? Well here’s something super important to remember: sadly, neither do cookies. I would totally plant a forest of cookie trees if that were a possibility. Because cookie producing trees don’t exist, I am going to show you how to make these cookies yourself. They’re really pretty, and totally perfect for an engagement, wedding shower, or even a wedding. 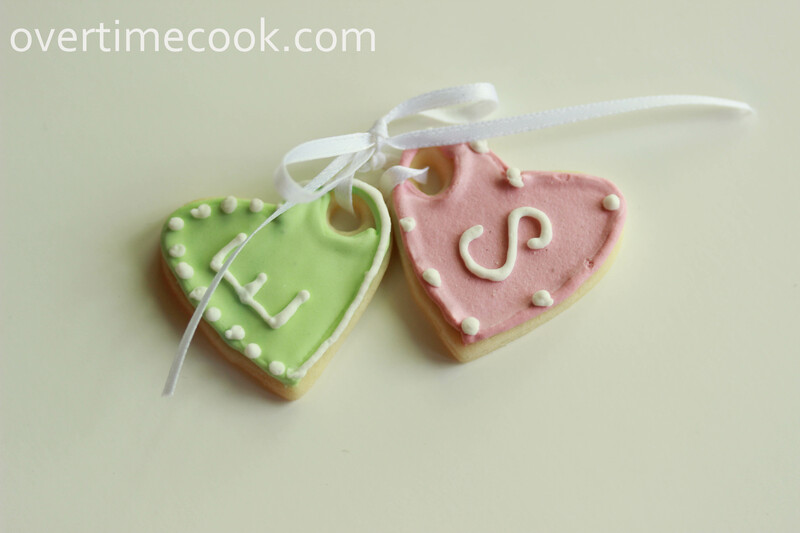 First, you are going to need a recipe of your favorite decorator’s sugar cookies. Here’s Mine. You’ll be needing a batch of royal icing too, which is on that link. Here’s what you’ll need to do. 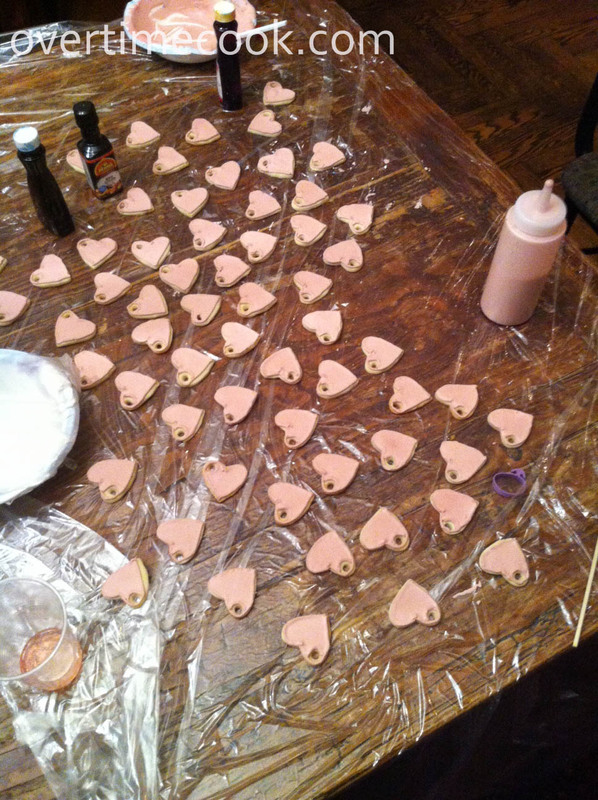 First, roll out the dough and cut out lots of little hearts. Next, take the straw and poke a little hole in the corner of each heart. Important: you will want to alternate between punching the hole on the right and left side of the hearts, so that all of the hearts of one color will be on the right, and all of the other color heart will have holes on the left. Bake the cookies (with the little holes removed) according to the directions of the recipe and let them cool completely. Read the direction on my clown cookie pop post on how to outline and flood the cookies, because I won’t be elaborating here. Divide the icing into 3 parts: two large bowls and one small one. Color one of the large bowls a nice girly color, and the other a nice boyish color. Or chose the bride’s and the groom’s favorite color. Or yours. You do want to make sure the colors look nice together. 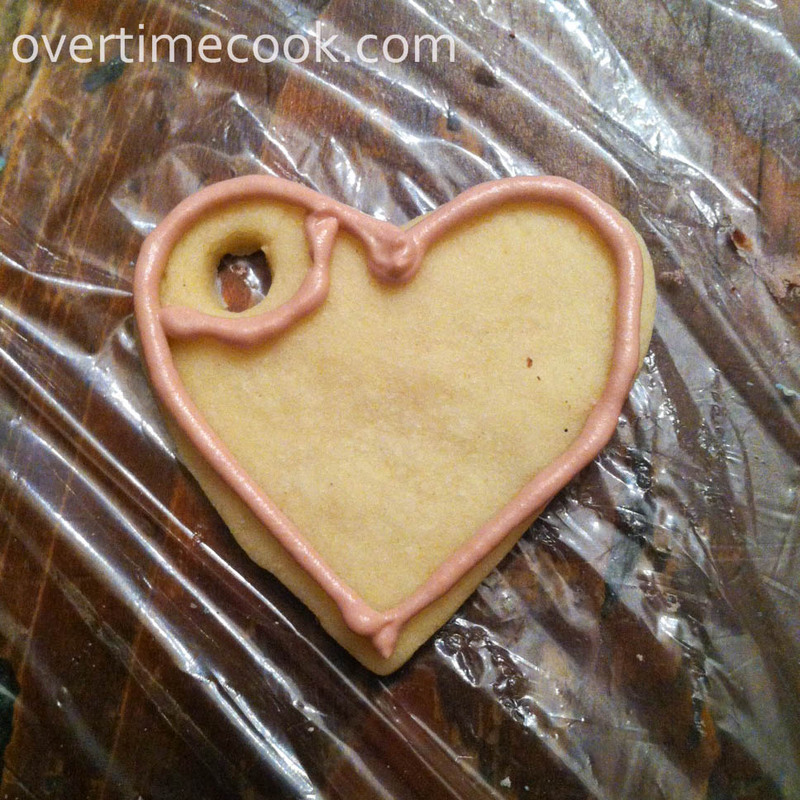 Outline the cookie like so: (make sure to pipe around the hole too!) Use a #2 tip for this. Or, you could be a little less insane than I was and do fewer than 120 cookies. Just a suggestion. Let the cookies harden completely. I waited overnight. You should to, or you might risk the colors flooding like they did on my clown cookie pops. 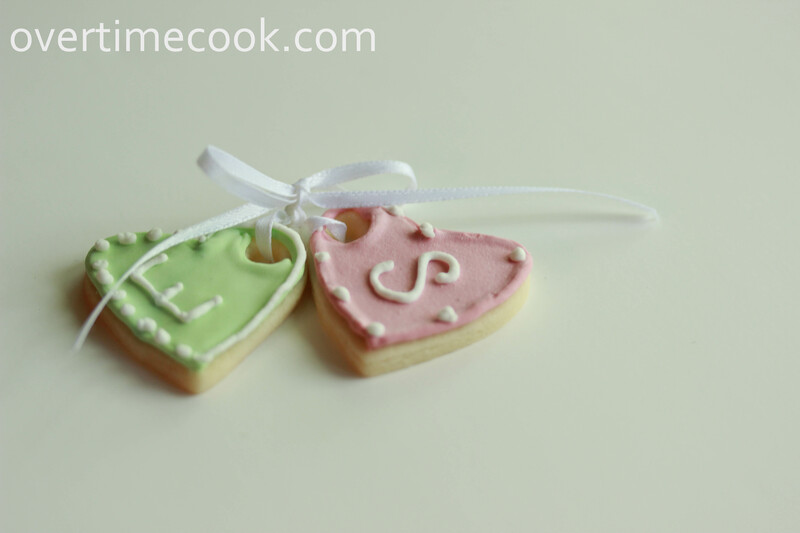 Use the reserved white icing (or you can use the other color for this) to pipe the initials of the happy couple- one per color. If your cookie is small (like mine) use a #1 tip for this. If it’s big, you can go for a #2. Or try both and see which you like better. Don’t make my mistake. 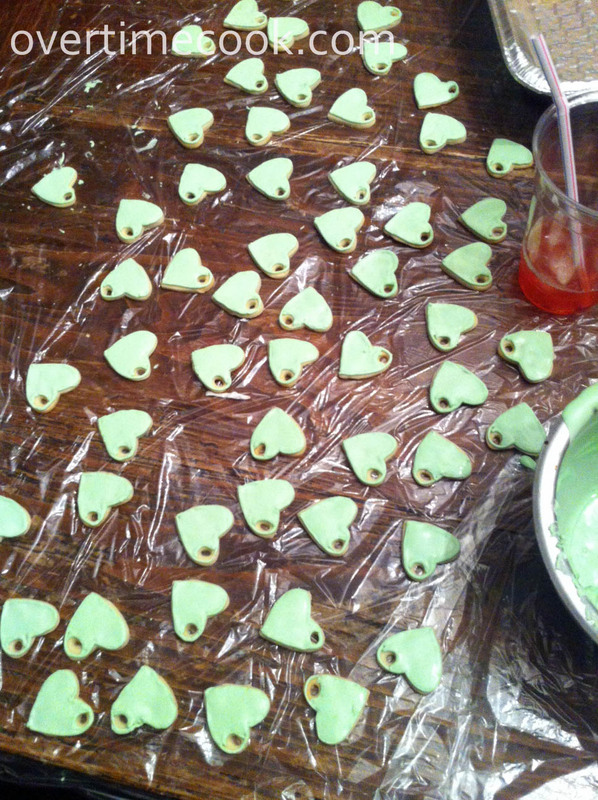 After piping S onto 60 pink cookies, I moved over to the green side of the table and began to pipe…more S’s! I was about five in when I realized my mistake, and luckily they were all still wet enough to wipe off and re-pipe an E. All’s well that ends in cookies, right? When you are done, if you aren’t totally sick of piping yet, or it’s only 2 am and you don’t have to be up for work until 6:30 am the next day, or you have more icing and don’t want it to go to waste, or all of the above, you can pipe an outline of white or the other color around the heart. Or you can pipe dots. Or some of each. Go crazy. Have fun. Once the icing has completely hardened, tie one of each color together with a ribbon and tie a nice little bow. Now display them at the party and pretend to be all humble about it while everyone gushes over your work. By the way, did you know that I am on Twitter? And on Facebook? And on Pinterest? And on Google+? Are you there too? Let’s connect! Wow Amazing! Congratulations on a job over the top well done! Thanks for this tutorial! Now I really need some Wilton tips. Glad you liked it Tali! Wilton tips aren’t expensive, the trick is to get just the few you need, not to buy a big kit full of tips you don’t actually need. Your tutorial was wonderful. Very creative of you coming up with the tree idea and your cookies look picture perfect! Thank you Tina! The tree really was the perfect (and very dramatic) way to highlight these cookies. I love this! Thank you so much for sharing! These are so elegant! Ha! I knew you were making engagement cookies and I was wondering why they were not in the previous post. 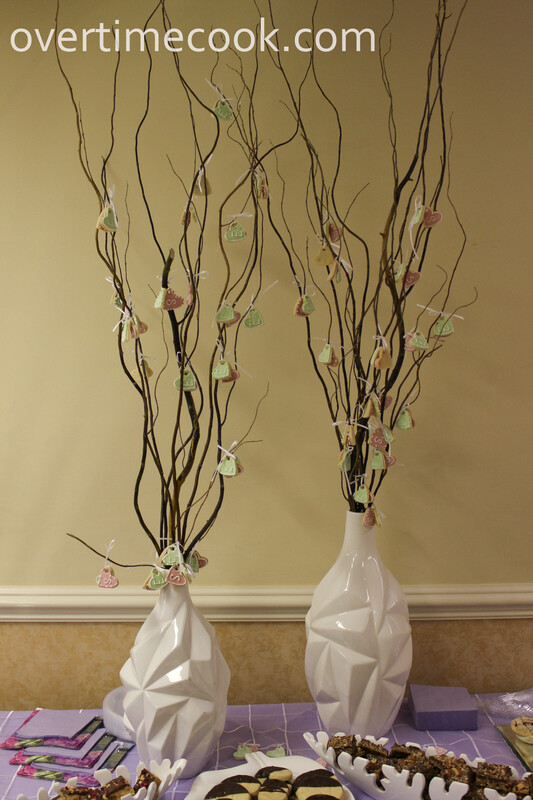 I did notice the branches in the vases but thought the little items hanging from them were made of tissue! 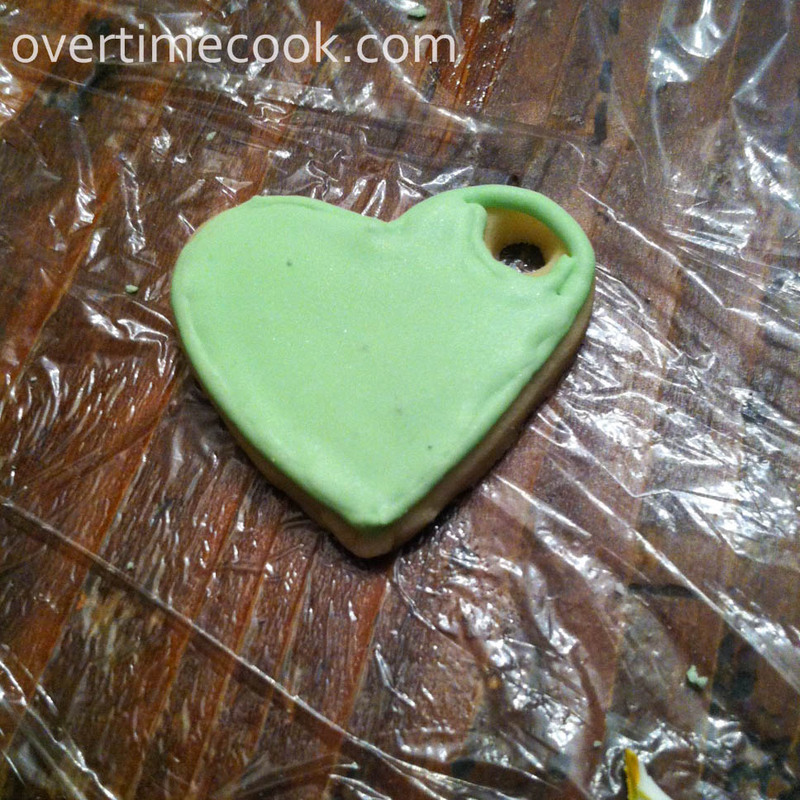 Your interlocking heart cookies are adorable and I love that you made them so tiny. So very well done….everything! Those look so great hanging from that twig-trees! These cookies are so cute! What a fun recipe! Those are adorable little cookies! Love it! Oh wow, I love the pastel colors you’ve used here!! These are gorgeous! can you tell me if they can be frozen before or after frosting them? These are gorgeous! Can they be frozen before or after frosting them? Hi, these look awesome! If I decide to freeze after freezing, how should I wrap them to make sure they stay nice? Will freezing them affect the taste?